“What gets measured gets done, what gets measured and fed back gets done well, and what gets rewarded gets repeated.”John E. JonesPerformance Based Contracting (PBC) has proven to be an effective commercial tool in reducing overall costs for buyers and providing profitable growth opportunities for sellers making it the contract model of choice across a range of market sectors. While deceptively simple, PBCs are different to conventional contracts and require a different approach to their development, implementation and management. An organisation’s ability to effectively develop, implement and manage PBCs is critical to business success. Failure to do so can often lead to long-term performance, financial and reputational damage.This book provides a comprehensive examination of how to apply a PBC approach across the contract lifecycle for both buyers and sellers; from planning, developing and releasing a PBC tender, through responding to a PBC, to evaluating, negotiating, implementing and finally managing a PBC. Must read for people who are new to PBL, experienced PBL practitioners and everyone in between. 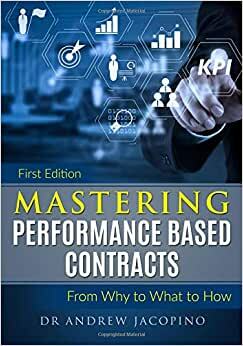 This book goes into all relevant aspects of performance based contracts. It covers PBL from both performance providers and customers perspective. Dr Jacopino is at the forefront of effective performance based contracting. This is how contracting should be done in industry and government. This book should be mandatory reading for government contractors and part of the contracting curriculum at the Defense Acquisition University.